I consult predominantly to professional service led organizations who think that sales is a dirty word! As an agent of sales effectiveness that makes my job, let’s say, adventurous. As an evangelist of social selling, well that makes me intrepid. I love selling, I love being social – I hate that I can’t truly be a social seller but such is the nature of my consulting role in advisory services. What I can offer however is a passion for social engagement and understanding changes in buyer behavior. Social Media allows me to do two things I strive to be the best I can at. 2. Growing a network that respects and utilizes my skills. I started my social life in 2006 after entering a job with a sales assessment, placement and training organization – for me the early stages of social engagement were hit and miss. LinkedIn was not the tool then it is now and my profile, like experience was fairly junior. I was however blindly determined and set about getting in front of as many sales leaders as I could, albeit in hindsight, inefficiently. My offline network grew quickly and my cheeky, ambitious and rather fearlessly naïve persona (mostly my peculiar accent) very quickly got me a brand. I desperately wanted to learn about sales and how what we did could make organizations better. Business had its up and downs, I was a trainee salesman, I had a great boss and I loved it. As a Journalism major, my desire to produce well-read content was a constant long before I entered the fantastic world of professional selling. In fact, I remember one of those ‘life conversations’ with the aforementioned manager where he asked me why I wanted to be a Journalist, working long hours to targeted deadlines and calling on people who didn’t want to speak with me... all WITHOUT getting paid COMMISSION. Needless to say I was swayed by his rhetoric and have been in professional sales ever since, now lucky to be advising other organizations on sales effectiveness and improvement. 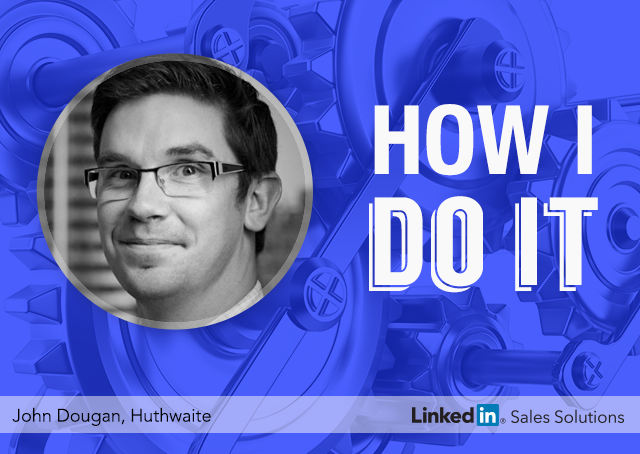 My real affair with Social Media, took shape when I moved from the UK to Australia, relocating to a new country and market prompted a different way of thinking about building a sales community in a similar role, different location. I thought back to my clients in the UK and used LinkedIn to search for counterparts here in Sydney, then Melbourne and eventually; still adopting cold calling techniques too, I had amassed a well-connected network of sales leaders nationally here in Oz. The ownership of this network prompted me to leave the comfort of my role after a few years and search for pastures new, utilizing connections and researching the footprint of a global organization online through both LinkedIn and my new medium of Twitter. After quite a frustrating but socially experimental year, new additions to LinkedIn’s influencer platform gave birth to an affirmation for my field of study and a desire to move back into an advisory, sales analyst role and in doing so I set out to find and consume the content of as many sales thought leaders as I possibly could. This leads me to Huthwaite, now part of MHI Global, where I have spent the last two fantastic years helping companies and their sales leaders in APAC build and sustain customer focused, high-performance organizations. Here I get to leverage my two focus areas by listening to customers who articulate socially that they are in growth or trouble. I get to create and publish my own content so that my customers feel I am in contact with them and I grow my network as a thought leader. I get to prospect and lead generate as an agent of MHI Global to boost my pipeline – I get to share research on sales best practice to build my brand and become synonymous with an organization helping to drive profitable, predictable top line growth for its customers. I use social media every day to prospect, find, listen, connect and engage with my customers and prospective customers. For the first time I can use a communication method which doesn’t intrude on their time - feel free to read my article in 33 Social Selling Tips by Leading Social Selling Thought Leaders – rather is an interactive opportunity for me to gauge their interest, understand their problems and offer tailored solutions. In summary, when it comes to Social Media adoption, you don’t have to make a decision whether or not to be active as a seller on it – your customers have already made that decision for you. As a sales professional all you have to decide is how you are going to take the skills that make you successful offline and translate them into a consistent manner online. If you want to be successful, go where your customers are, go there with purpose and go there to add as much value as you can – go forward and don’t look back – in fact Go Social and you won’t have to.